Location: Big Island Lake Wilderness, part of the Munising Ranger District of the Hiawatha National Forest, lies about one-half mile northwest of the community of Steuben - 22 miles northwest of the city of Manistique and about 18 miles southeast of the city of Munising. Big Island Lake Wilderness is bounded on the south by County Road 437 and on the west by County Road 445. The remaining border is delineated by Forest Road 2303 on the northeast and an abandoned railroad grade (Haywire Grade - Forest Road 8109) on the south side. 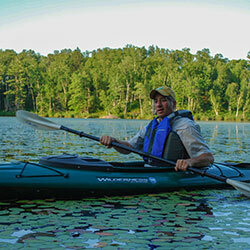 Big Island Lake Wilderness is located centrally in Michigan's Upper Peninsula. White birch, maple and aspen cover the wooded hills that surround the lakes. This wilderness contains 23 small lakes ranging in size from 5 to 149 acres. Some of the lakes are connected by maintained portages while some of the lakes are remote, making access more challenging. 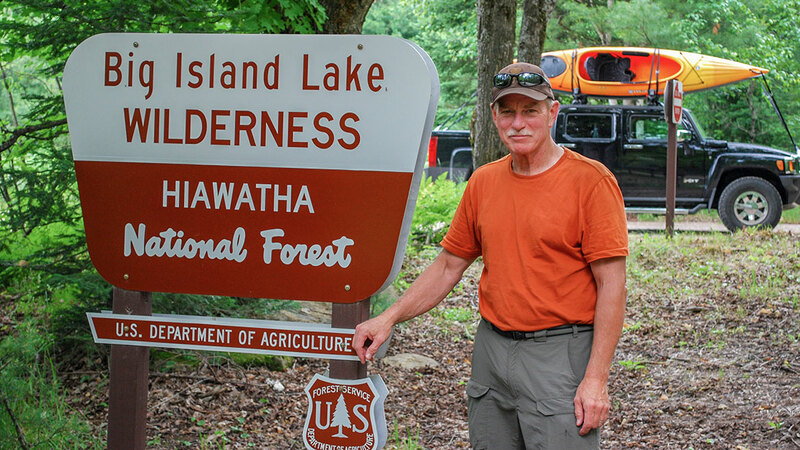 Big Island Lake Wilderness offers remote, non-motorized recreation opportunities for those who want to be free of amenities -- you will find no directional signs, no restrooms, and no trashcans. There is no easy access and no wheeled or motorized equipment is allowed -- so if you want to canoe or kayak, you can't use portage wheels; you must carry your watercraft across portage trails to reach the water. Three Season Cafe is located in Manistique, Mi. It is the best place to go for that good old home town feel. Food just like mom use to make and some of the finest homemade soups and homemade pasties around. 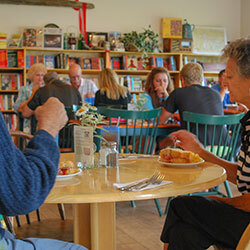 Three Seasons Cafe offers a full menu. Location: Arrowhead Road on the East Side of Indian Lake 4.7 Miles NW of Manistique. 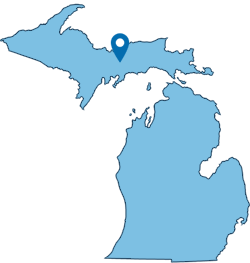 During his lifetime, Baraga founded many missions in northern Michigan. The original Indian Lake mission, the third of Baraga's faith, was built in anticipation of his first visit to the area in May of 1832. 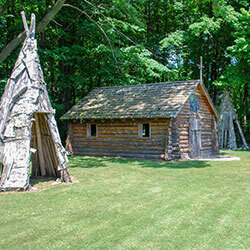 The chapel, built by local Chippewas, used traditional Indian construction methods and materials such as logs and bark. The Indians replaced the first chapel with a larger one in 1833. Records suggest that the chapel may have existed until 1873. Based on historical information, the Indian Lake mission was rebuilt in the early 1980's on the original mission's site. 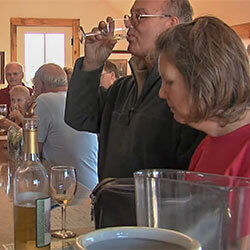 Mackinaw Trail Winery is a family owned winery. Nestled in the heart of the Upper Peninsula, the winery in Manistique offers a unique waterfront setting. Winemakers Ralph and Dustin Stabile produce a variety of exceptional wines from 100% Michigan-grown grapes from some of the best vineyards in the state. Hours: Open Year Round. Spring Hours - Monday-Saturday 10am-3pm. Open 7 days Memorial Day to Labor Day. With over 30 deli style sandwiches to choose from on bread baked fresh in their own ovens, you will be sure to find one that will become your favorite. Try a garden fresh salad, homestyle soup, and make sure you save room for one of their homemade desserts. 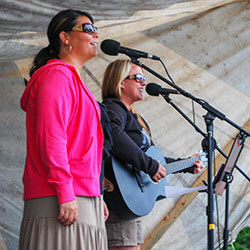 Folk Fest is a celebration of life that takes place the 2nd Saturday in July on the main street of Manistique, Michigan. Art and Craft Booths display their diverse wares on one block while the aromas of Multicultural Food Booths tempt the participants down the street. A central stage provides ethnic music and entertainment and a Children’s Area supplies the younger people with special fun. Folk Fest is truly an event for everyone.